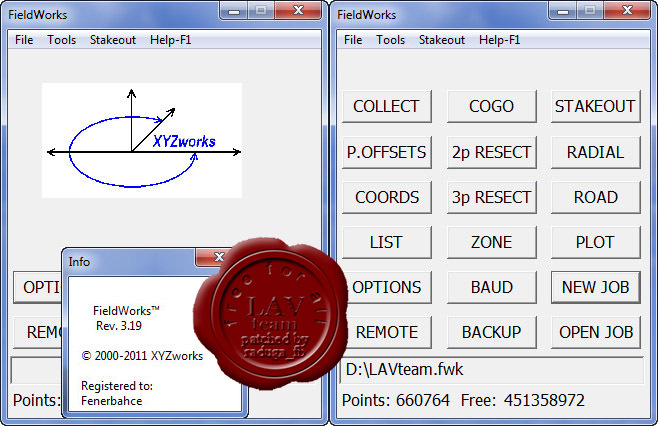 The Fieldworks program is an easy to use and powerful program for Land Surveying and Construction Layout applications which features full screen data entry, and fast, accurate execution. It uses the latest and most advanced Pocket PC hardware to provide unparalleled features and computation speed, and the Windows CE operating system to make it easy to learn and use. Fieldworks has been available for PocketPC’s longer than any other surveying software, since May 2000. FieldWorks boasts such features as single keystroke measurement, easy to read display, simple transfer of data to and from your office PC, and plenty of storage capacity (600,000 points in a 64MB device, expandable.) The large display shows over 4 times as much information as most products, including full screen plotting. Fieldworks runs on a wide variety of different computers and downloads data from a wide variety of field equipment, both optical and GPS. Easy to integrate GPS with total stations in the same job. Easy to upgrade to a full CAD system using our optional PocketCAD addins to pick points from a drawing and plot-as-you-go based on point descriptions. There is a desktop version available so that you can use the same powerful software in the office and the field.